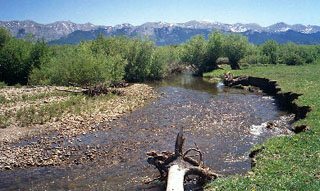 Description: Approximately 1.5 mile of this meadow stream, which averages 20 feet in width and has strong populations of rainbows and browns. Most of the stream has heavy willow cover with cut banks and deep holes. The property also has a 2-acre pond, wich is a nice size for float tubes. Location: The property is located at the base of Cameron Pass, approximately 2 hours northwest of Denver. Capacity: Limited to 2 anglers.